Would the Tea Party Welcome Jeb Bush? Or Vice Versa? The Tea Party is losing influence, and centrist Republicans are losing patience with it. Earthquakes do happen in Virginia—we were there, in Virginia, during the real Virginia earthquake in 2011—but what happened in a rural, remote central Virginia congressional district last week, when Eric Cantor was toppled, shouldn’t register very high on the political Richter Scale, despite CNN’s headline: “Cantor ‘earthquake’ rattles Capitol Hill.” Widely cited as a sign of the Tea Party’s renaissance, after the Tea Party suffered a series of bloody defeats in primary after primary in 2014, the Cantor defeat—and perhaps the upcoming defeat of Senator Thad Cochran in Mississippi next week—isn’t an earthquake at all but rather the dying tremor of a movement that is being put back in its cage by the GOP establishment. And for 2016, that means that the Republican party and its main pillars, such as the US Chamber of Commerce, the Business Roundtable, Wall Street’s banks and hedge funds and Karl Rove’s national political machinery, will make sure that the party nominates a mainstream conservative such as one of the GOP’s stable of current and former governors (Jeb Bush, Chris Christie, Scott Walker, John Kasich, Mike Pence, Susana Martinez, etc.). Even many rank-and-file Republicans are sick of the Tea Party’s shenanigans. A new Wall Street Journal/NBC poll found that 41 percent of non–Tea Party Republicans believe that the Tea Party has “too much influence.” (The poll found that the GOP is pretty much evenly split between Republicans who identify with the Tea Party and those who don’t.) A Washington Times article, analyzing what it calls the “decades-long brawl” between ultraconservative purists and GOP traditionalists—which, it says, dates to the fight over President George H.W. Bush’s decision to break his no-new-taxes pledge—says that now it takes the form of a struggle between no-compromise types and those, such as Christie, who say outright that the priority has to be placed on winning elections. Democrats, who’ve had their own struggles between idealism and pragmatism when it comes to lesser-evil candidates, may want the GOP to pick likely-loser extremists who’ll lose big, but it’d be wrong to count on that either in 2014 or, especially, in 2016. The rise and probably fall of the Tea Party is an interesting phenomenon when viewed from the “decades-long” perspective that the Washington Times notes. In the Washington Post’s The Fix, Aaron Blake tracks the Republican party’s up-and-down from moderate-conservative to Tea Party–like over the years, and he shows that the presence of ultraconservatives—that is, Republicans who described themselves as “consistently conservative”—actually fell from 13 percent in 1994 to 10 percent in 1999 and to just 6 percent in 2004. But tracking the growth of the Tea Party, the number of “consistent conservatives” rose to 17 percent by 2011 and 20 percent in 2014. In looking at those numbers, it seems clear that the huge jump between 2004 and 2011 is a reflection of the effort to demonize Barack Obama, with a heavy dollop of racism and race-baiting built in. In fact, “consistent conservative” is a broad notion, and it’s fair to question the poll conclusion in the Wall Street Journal/NBC poll cited above that 43 percent of Republicans “identify” with the Tea Party while 43 percent do not. The actual strength of the Tea Party within the GOP is a lot smaller than 43 percent, and the “very conservative” GOP voters are themselves divided into evangelical voters, or the Christian right (about 20 percent of the GOP) and the ultraconservative secular voters (perhaps 5-10 percent). In the past, however, some middle-of-the-road, traditional Republicans may have admired the Tea Party for its feistiness, even if they didn’t agree with its kookiness and extreme positions. Now those centrists are coming home. 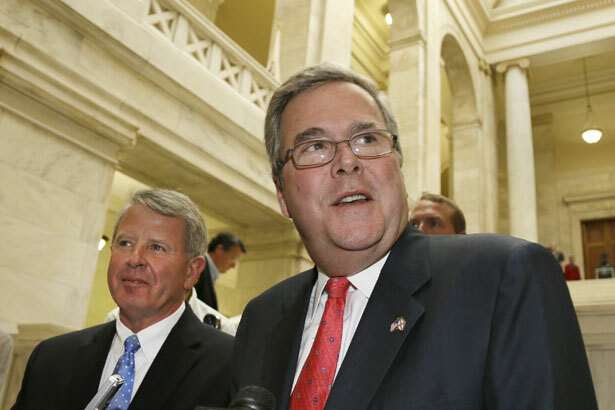 So, what does that say about someone like Jeb Bush in 2016? Over at National Journal, Tom DeFrank seems to think that Bush would make a good running mate in the vice presidential slot for a strong conservative or Tea Party type at the top of the ticket, though in the Atlanta Journal-Constitution Kyle Wingfield writes that the notion of VP Jeb “seems totally, completely, impossibly weird.” More than that, in fact: it seems impossible altogether. But that doesn’t mean that Tea Party types and others on the far right won’t eventually acquiesce to the notion that in order to win in 2016 the Republicans will have to choose someone closer to the mainstream. While many Tea Partiers are hard-core ideologues, many others are pragmatists. The Tea Party can read the tea leaves. And the tea leaves say it’s going to take a centrist to beat Hillary Clinton. So, will the Tea Party welcome Jeb Bush? Let us put Jeb to the test and invite him to become a fellow tea partier. If he genuinely accepts the invitation, he should get serious consideration as an opponent to what is likely to be Hillary Clinton as the Democrat nominee. … So don’t write off Jeb. If he comes to us, be prepared to consider him. Any opponent of Hillary Clinton needs “mucho” Latin votes to rid the nation of the stench of the Obama administration and prevent the return of the Clintons. Even if Jeb is branded as a “Bush” and not perfect (no politician today is), … he is at heart a conservative and can possibly win if he sincerely moves further right, joins “our party” and learns to drink our brand of tea. Mambo!